Strength training is important for everyone, especially seniors. As we age there is muscle loss. Some of this loss is due to getting older. However, most muscle loss in older adults is due to lack of use. You have to use your body actively or you lose a great deal of it's function. This is where resistance training comes in. Designing a program of exercise that includes resistance training is the way to go. Some people may be a little intimidated by the thought of lifting weights. The fact is you don't have to go to a formal gym to do resistance training. Lifting weights is a fantastic way to train. But not everyone has the resources or inclination to workout in a gym environment. The goal is to develop functional power and all you really need is a way to increase muscular tension as you exercise. Alternative methods will serve this purpose just fine. All it takes is a little creativity on your part. You can spend a little money to purchase a set of light dumbbells. Or if you don't want to spend money, you can make your own set of weights. Just take a couple of gallon milk jugs and fill them with water or sand. They make a very acceptable set of weights. You can also use cans of fruit or vegetables before you open them to eat. If you use your imagination a little bit you can find other items around your house that would serve very well as makeshift weights. Elastic bands also can provide a way to do resistance training.You can actually do most of the very same exercises as you would with a pair of dumbbells. Good old-fashioned push-ups and crunches are one more alternative to weightlifting. 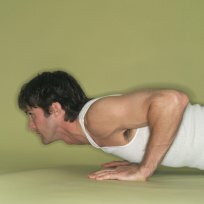 There are many free-weight exercises that can be done which wouldn't cost you a cent to perform. Possibly buy a book on calisthenics; or visit your local library to get ideas on which exercises are best for your strength training.